Sweet Yumi asked in a previous post about my skin care secrets. Here they are! In my teens, I had horrible skin. I was so embarrassed by my acne and it was pretty bad. I tried so many topical products to no avail. Turned out it was my hormones and after I fixed that, my skin cleared up. When I hit my twenties, I really made it my goal to take care of my skin so I started a good skin care regimen and stuck with it. My mom and grandmother have always taken care of their skin and everyone thinks they are way younger than they are so, hey - might as well follow their lead! I also don't wear a lot of color on my face/eyes. I'm not that into it. Instead, I prefer to make my skin look the best and healthiest it can and I think that goes a long way as opposed to loading on color. is awesome as it only takes 5 minutes. It leaves my skin glowy and refreshed and I even got my sister hooked on it who then got it for our mom. I use this every other week or so. 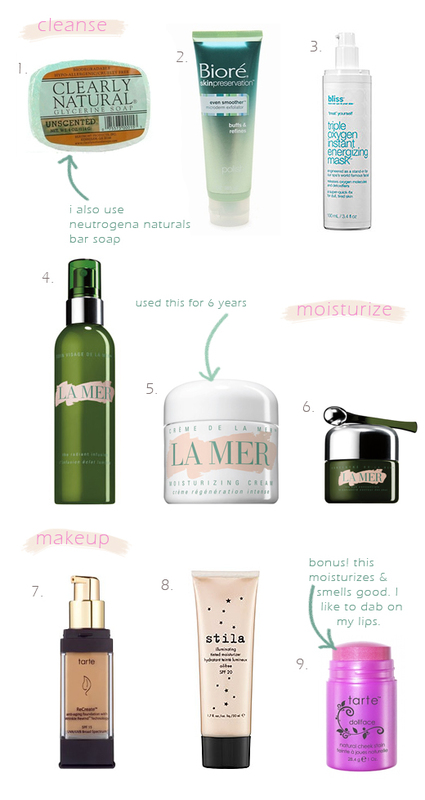 To moisturize, I love La Mer products. I start out with a base of their Radiant Infusion(4) to prep my skin. I then slather on their Creme De La Mer (5). I finish at night with a dab of their Eye Concentrate(6) under my eyes. I also use their Lip Balm, which is the best. Most days, I'm too lazy or busy to put on makeup. It's such a luxury! On the rare occasion that I do put on makeup, I like to prime my face with a foundation primer like Laura Mercier's Foundation Primer Radiance. I usually skip this step though. The foundation I've used for the past couple years is Tarte's ReCreate™ Anti-Aging Foundation With Wrinkle Rewind™ Technology SPF 15 (7). It's lightweight, mostly natural and has SPF. I have very oily skin that I used to hate but now really appreciate. I don't care how greasy my skin looks anymore (used to be hyper paranoid about it) as oily skin helps prevent wrinkles. I just think that if my skin looks like an oil slick, at least it's keeping wrinkles at bay. After applying foundation, I do like a little deliberate glowiness, so I dab on some of Stila's Illuminating Tinted Moisturizer Oil-Free SPF 20 (8). When I want some added dazzle, I tap a little Benefit High Beam onto the cheeks. After that, I apply Tarte's Cheek Stain in Dollface onto my cheeks. This is hands down, my FAVORITE cheek color & product of all time. I've been using for a few years and anytime I deviate away from it to try something new, I go right back to it. It is moisturizing, adds the perfect amount of blendable color and it smells nice too! For all the face makeup (foundation, cheek stain, etc. ), I apply using my fingers. I don't own a foundation sponge or brush. I try to steer clear from harsh chemicals and try to use as much "natural" as possible, with the exception of a few awesome products that work well for me. I hope this was a fun read!! !